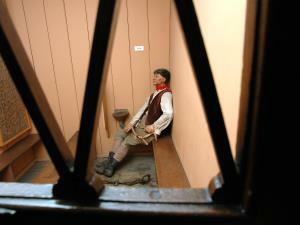 The accused awaits trial, small cell adjacent to the main courtroom at the Shirehall. The Shirehall Museum was converted from a rare survival, an original Georgian courthouse, also known as the Shirehall, which was in regular use until 1971. It now houses displays on the history of pilgrimage to Walsingham, law and order, and local photographs and artefacts. Local Tourist Information Centre and gift shop. Combined admission to Walsingham Abbey Grounds and the Shirehall Museum, Adult £5.50, children 6-16 £2.50. Under 6 free.